It takes a lot of moxie to run a saloon in the Wild West. If those old spaghetti western movies have taught us anything, it’s that you never know what kind of character is going to walk through the door to order a drink. Will it be dashing, heroic cowboy, or will it be some kind of villainous thug that needs to be taught a lesson? If you plan on owning the saloon, then you’d better know how to deal with both kinds of characters and you’d definitely better be dressed for success in the old west! After all, you can’t always count on the sheriff to solve your problems and you’re not the kind of girl who’s going to take any guff from rowdy cowboys! Yes, you need attitude and style if you want to keep all those rowdy cowboys in check. That means you need to be ready to kick hooligans out while keeping a profession (yet cute) look. If you can supply the attitude, then we can help you out with the perfect outfit. 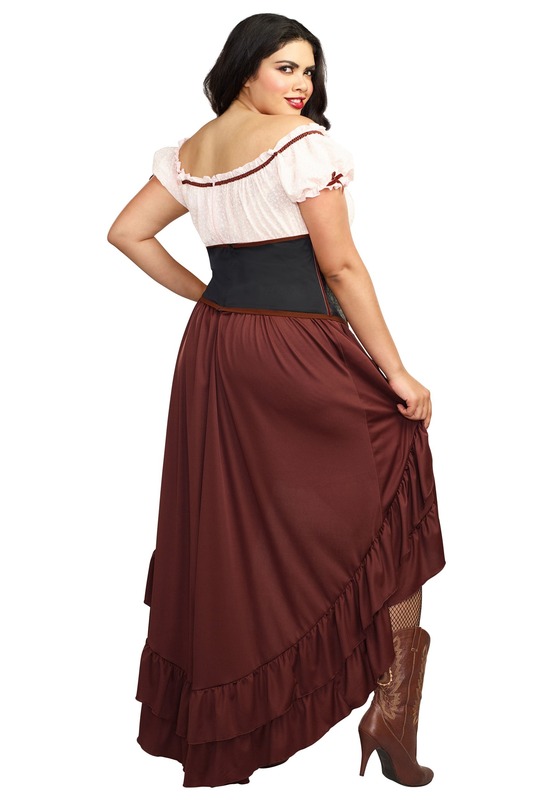 This women’s Saloon Gal Costume is a plus size outfit that will have you ready to oversee the local saloon. The costume takes notes from classic saloon girl styles to help you achieve a feisty and authentic look from the time period. The dress has a flowing maroon skirt with matching maroon ribbon accents along the bustline. The over the shoulder sleeves also have matching maroon accents. The bodice is made of a black faux leather material for a traditional Wild West look. Just make sure to pair it up with some cowgirl boots and some fishnet stockings to get the complete look. When you slip into this women’s plus size costume, you’ll feel ready for any kind of saloon shenanigans that happen at your next costume party!